Acquired before 1859. Lent to the British Museum in 1914, returned 1954. 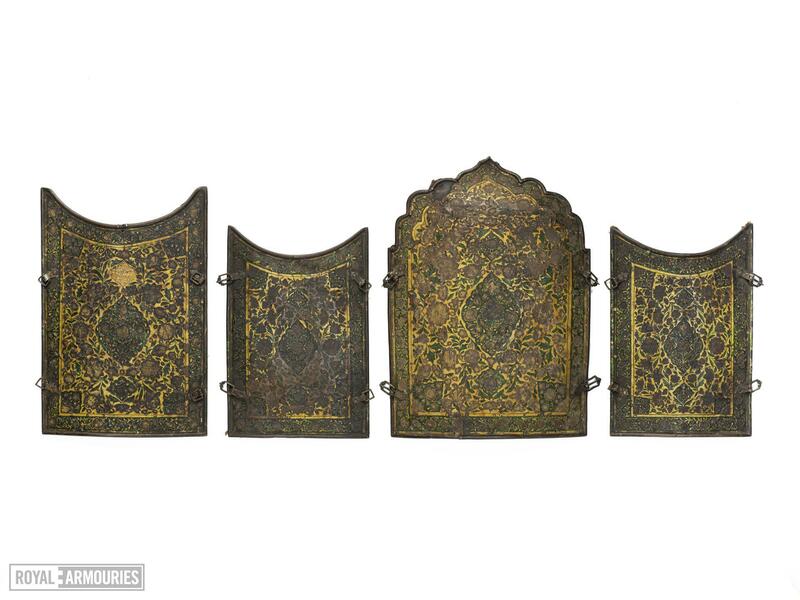 The Cuirass consists of four rectangular plates of copper with a shallow transverse curve. The plates for the breast and the two sides have a semicircular cut out at the upper edge while the plate for the back rises to a point in lobated steps and curving inwards to fit the back of the shoulders of the wearer. 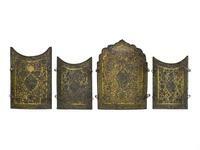 The edges of the plates are reinforced with strips of brass of semi-circular section riveted on. The plates are lined with quilted crimson velvet and are also secured with small rivets. Buckles and loops of iron are provided at the edges of the plates for connecting one to the other with narrow straps, three of which survive. 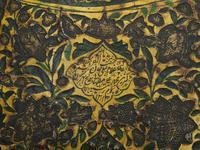 The surface of the plates are decorated with a gold lacquer ground and with an overall pattern of enamelled flowers and green foliage, with corner and central panels and a narrow border with gold foliage on a green ground. Only small fragments of the raised enamel flowers survive, most of them having been chipped away leaving areas with hatched grounds to hold the enamel. 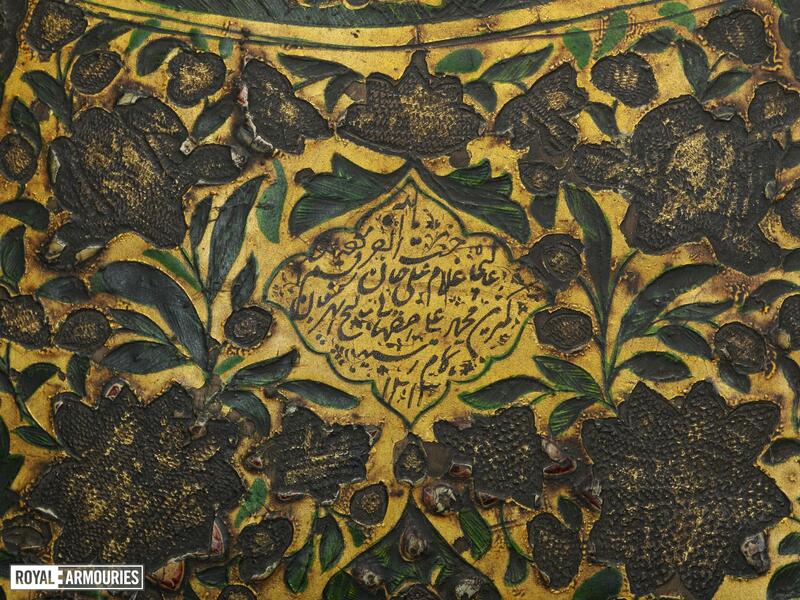 A laquered panel at the top of the breast bears the inscription in persian 'Oh God. By the order of His Excellency Ghulam Ali Khan. Written (or:Drawn) by the most humble [servants of God], Muhammad Ali Isfahani. It was finished in the month of Shaban, 1213'(1799). Dimensions: Front measures 320 mm by 217, the back measures 365 by 267 mm and each side plate measures 270 mm by 190 mm. Weight: The weight of each side plate is 0.045 kg, the front is 0.6 kg. and the back is 0.8 kg. J. Hewitt, Official catalogue of the Tower Armouries, London, 1859, no. xv.506-9, p.114. W. Egerton, An illustrated handbook of Indian arms, London, 1880, no. 764. Viscount Dillon, Illustrated guide to the Armouries, London, 1910, no. xv.2-5, p.11.